Hurricane Irma claimed at least 19 lives as it barreled across the Caribbean toward Florida Friday, leaving a trail of catastrophic devastation that has affected more than a million people in the region. Storm damage in St. Martin. Credit - AP. The ferocious winds and torrential rains unleashed by the storm destroyed homes, hospitals, and infrastructure and left many people missing in the northern Caribbean territories it passed over. 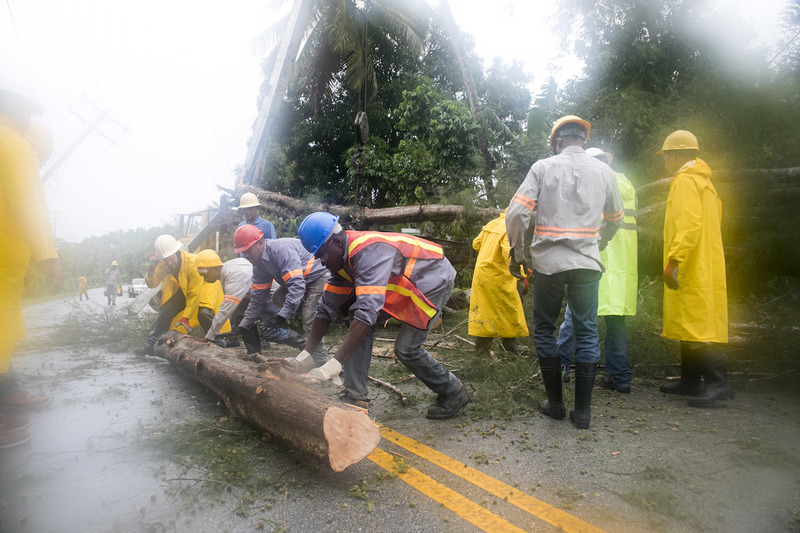 Electrical company employees work to clear a road blocked by trees felled by Hurricane Irma, in the Dominican Republic. Credit - AP. The death toll is predicted to rise. 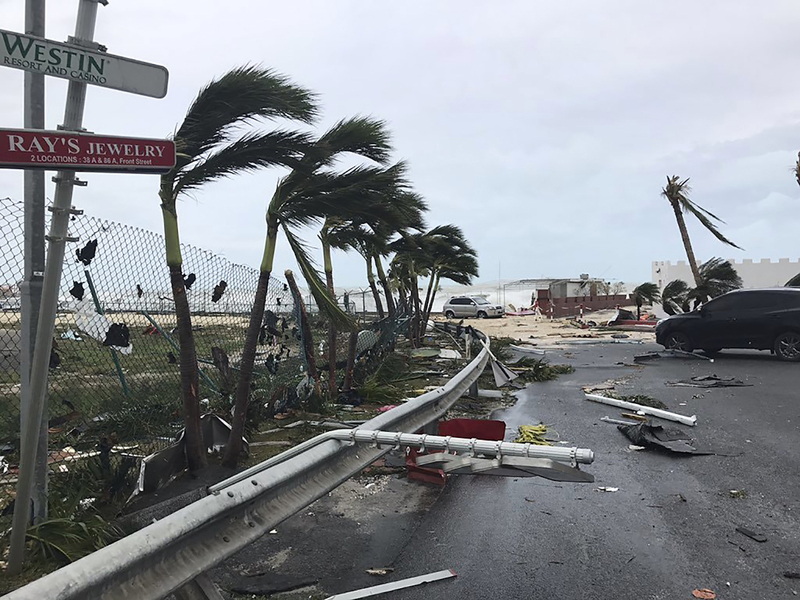 Among the deaths reported so far are nine in the French Caribbean, four in the U.S. Virgin Islands, three in Puerto Rico, and one each in St. Martin, Barbuda, and Anguilla. A vessel approaches Sandy Bay Village beach, in Anguilla loaded with the 2 JCBs, 1 flatbed lorry, fork lift truck, BV 206 multi terrain vehicle, a Land Rover, and a mobile generator. Credit - AP. The hurricane, one of the strongest ever recorded in the Atlantic, was downgraded to a Category 4 storm at 5 a.m. ET Friday but remained “extremely dangerous,” with maximum sustained winds of 155 mph, the National Hurricane Center said. Passengers wait to evacuate Miami before Hurricane Irma hits. Credit - AP. Located about 450 miles (720 km) southeast of Miami Friday morning, Irma is expected to create a “life-threatening situation” over parts of the Florida peninsula and the Florida Keys when it arrives Saturday night, bringing serious storm surges and flooding, the National Weather Service said. Roads and airports in the state have been crowded as locals heeded directives for 500,000 people to evacuate at-risk areas of south Florida, which could be left “uninhabitable for weeks or months,” according to the National Weather Service. U.K. soldiers get equipment ready to help those affected by Hurricane Irma. Credit - AP. “Hurricane Irma continues to be a threat that is going to devastate the United States in either Florida or some of the Southeastern states,” said Brock Long, head of the Federal Emergency Management Agency, warning that more than 100,000 people could need shelter. St Johns County Florida residents wait for the arrival of sandbags at Mills Field early Friday. Credit - AP. Having pummeled the Turks and Caicos Islands, the eye of Irma is forecast to move between the central Bahamas and Cuba’s north coast Friday, according to the National Hurricane Center. Tens of thousands of tourists have fled Cuba to escape the brunt of the storm, and there has been a massive evacuation from low-lying areas in the southeast of the Bahamas, where 20-foot storm surges are expected. People secure their belongings ahead of Hurricane Irma in Caibarien, Cuba. Credit - AP. Britain, France, and the Netherlands have sent aid, rescue teams, and emergency services to their affected territories, but more trouble is on the way. As the battered islands reel from the storm and attempt to assess the damage, another major hurricane, the Category 3 Jose, is expected to hit the northeastern Caribbean Saturday, likely bringing further misery. The Red Cross says up to 26 million could ultimately be affected by Irma, with concerns that disease could spread in areas where sanitation infrastructure has been destroyed. Business owners board up their premises before Irma hits Miami. Credit - AP.